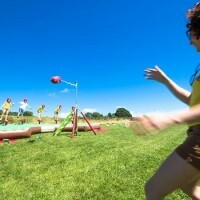 Get yourselves down to the farm for some fun and frolics in the fields and fresh air! Ooh aar! This totally hilarious ‘West Country’ day out is guaranteed to have you rolling in the hay with laughter. Forget the usual Stag and Hen events and get yourselves down to the farm for some fun and frolics in the fields and fresh air! Ooh aar! This totally unique and hilarious ‘West Country’ day out is guaranteed to have you rolling in the hay with laughter. Our farmer & his hosts will take good care of you, provide fancy dress for the Stag or Hen, take photos of your day out, and present a prize for the winner at the end. Proper job! There are nice crazy games, all scored for points ready for a themed prize at the end.